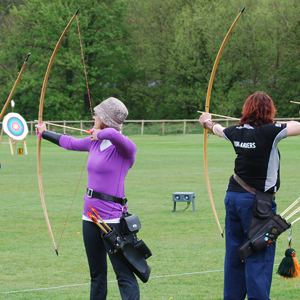 Archers of Bridlington and Burton Agnes will be holding two beginners courses in 2019. The first will commence on the 28th of April and run for six consecutive Sundays. The second will commence on the 28th of July and run for six consecutive Sundays. for further details and contact information. Pennine Archers of Linthwaite near Huddersfield will be running a beginners course on Sunday mornings in March 2019. The course consists of four sessions, each three hours long. Sessions are indoors. The sessions will run from 9:30 AM on the 10th, 17th, 24th and 31st. The Bowmen of Adel, based in north Leeds, will be running six beginners courses in 2019. The sessions will run in the evenings from 7:00 PM to 9:00 PM. Harvester Archers, based in Doncaster, have organised two beginners courses for the early part of 2019. The courses are designed in accordance with guidelines issued by Archery GB and consist of four 3 hour sessions held on the dates and times shown and are always held indoors. 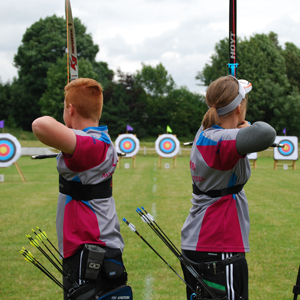 You will be taught by qualified coaches and experienced archers. We provide all the equipment needed for the course. Places are limited and pre booking is essential as we cannot accommodate people turning up on the day. Minimum age is 14 years and all juniors must be accompanied by a parent or guardian at all times. The course fee is £50.00 and includes the use of all equipment and appropriate insurance. Many clubs run beginners courses. Typically these last for six sessions, one session per week, and beginners are required to complete this course before they can become full members. Such courses are intended to get you up to a standard where you can shoot safely and enjoyably. Contact clubs in your area to find out which are running beginners courses, when they will be running them and how much they cost. We advise beginners against buying bows and arrows immediately. It's best to complete a club's archery instruction course and gain some experience in using the equipment before making a purchase, otherwise you could buy equipment that is not suitable for you. This is especially likely to happen if you go to a general sports shop or fishing tackle shop rather than a specialist archery dealer. 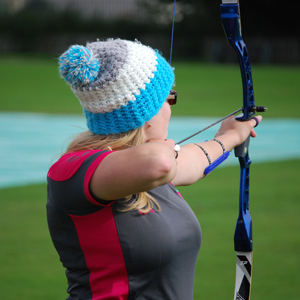 Clubs usually have a number of bows and sets of arrows that beginners may use, and club members will have plenty of advice on what equipment will suit you. There is no upper age limit in archery - some people continue well into their eighties. There is no hard-and-fast lower age limit either, but many coaches have found that 10 years old is a sensible lower limit. Children younger than 10 sometimes struggle physically to control a bow, and children under 7 often don't understand the safety instructions. If in doubt, a club's coaches will often be willing to assess the child's suitability at a special session. Our national association has issued some guidelines on the protection of children and vulnerable adults. We encourage all YAA clubs to follow these guidelines. The guidelines require that a parent or guardian accompanies children under 14 years of age throughout the duration of the beginners course. 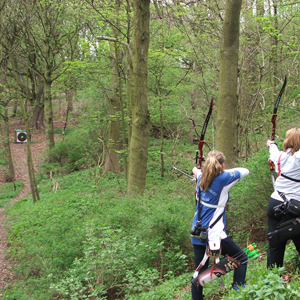 At least two adults must be present, at least one of whom must be a member of Archery GB. Children aged 14 years or over may shoot only if there are at least two adults present. These adults may be club members, parents or guardians. At least one of these adults must be a member of Archery GB. Similar considerations apply to vulnerable adults. The exact rules will depend on the nature and severity of the vulnerability. For more information about child protection, please contact the YAA's Child Protection Officer, Martin Holtby, via martin @ oglass.karoo.co.uk. There are many different forms of archery that may interest you. Below are some descriptions of the most common forms of archery in the UK. Beginners usually start by shooting target archery with recurve bows, even if they intend to shoot another type of archery or bow later. The current Olympic form of the sport. This popular form of archery takes place on flat terrain and consists of shooting a round. A round is a certain number of arrows shot at targets over one or more known distances of up to 90 metres/100 yards for men and 70 metres/80 yards for women. Juniors shoot shorter-distance rounds, depending on age. Recognised bow styles for target archery are freestyle recurve, barebow recurve, compound unlimited, English longbow and American flat bow. Indoor target archery, with smaller target faces and shorter distances, is shot during the winter months. Derived from hunting, field archery takes place on a course of targets (usually 24) set out in woodland and rough terrain. Please note that hunting with archery equipment is strictly illegal in the UK. Field archery can be likened to golf in that the approach to each target is different from the previous one and each target has its own distinct challenges. Your group of four archers starts at one target and completes a circuit of all the targets over variable terrain. The shooting distances are either marked or unmarked. If shooting on an unmarked course, you estimate the distance then set your sight (if you're using one) accordingly. Estimating can sometimes be quite tricky as not only are the distances and terrain varied, but also the target sizes. Target sizes vary from 15cm up to 80cm. A skilled course layer can make use of lighting conditions, dead ground and background to make a target look nearer or farther than it actually is. Unlike target archery where you shoot your arrows, score them, then walk back to the shooting line, in field archery you shoot your arrows from a peg (a stake in the ground), walk to the target to score them, then walk on to the next target. There are many different bow classes in field archery. The archer attempts to drop arrows at long range (180 yards for men, 140 yards for women, various distances for juniors) into a series of circular scoring zones on the ground surrounding a marker flag (the clout). The circular zones form a giant target, with the zones nearer the flag scoring higher than those farther out. The zones are not usually marked on the ground. Instead, a marked rope is attached to the flag after an end has been shot. The rope is swept around the flag and arrows in each scoring zone are collected and sorted. The atmosphere at most clout shoots is quite relaxed and friendly. Yorkshire has a thriving clout scene. A form of archery that can only take place where space permits since archers compete by shooting for sheer distance. An ideal place is an airfield. Leeds East Airport (formerly RAF Church Fenton) in Yorkshire is one of a very few regular flight-shooting venues in the world. 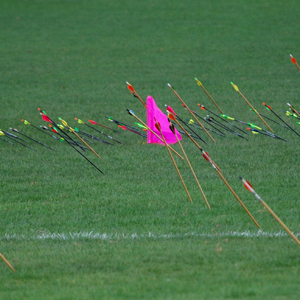 A flight shoot normally consists of two dozen arrows shot in six-arrow ends. When everyone has shot you all set off looking for your arrows then flag the farthest with an identifiable marker, which remains there until superseded by a longer shot. When all arrows have been shot for the day you stand (or sit, if you've any sense) by your marker until the judges get around to measuring it. There are many different classes that you can shoot in, categorised by the bow style and draw weight. 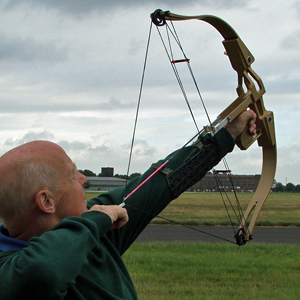 There are categories for specialised flight bows, such as that of Alan Webster in the photo to the left, but most flight shooters use regular target equipment. Originally derived from shooting birds on church steeples. 'Popinjay' is an old word for a parrot. A not-very-common form of archery in which the object is to dislodge wooden birds from perches at a distance. In the olden days, a live bird was used! Popinjay comes in two forms: vertical and horizontal. In vertical popinjay, archers stand near the bottom of a 90 foot mast and shoot almost vertically upwards with blunts (arrows with a rubber cap on the front instead of a point) at wooden birds set on perches attached to the top of the mast. In horizontal popinjay, the birds are set on perches a few metres high and several tens of metres from a shooting line. Horizontal popinjay is popular in Belgium, but has probably never been shot in Britain. Britain's oldest archery club, at Kilwinning in Scotland, has been running a 'papingo' tournament since the fifteenth century. In their version, a bird built from wooden pieces is attached to a pole projecting from the Kilwinning Abbey tower, 100 feet up. Initially, the wings are fixed to the bird and the bird is loose on the pole. The winner is the first person to dislodge the bird (known as "dinging doon the doo"). After that, the bird is fixed to the pole and the wings are loosened - the runners-up are the archers who dislodge the wings. Slightly odd, given that it's a lot easier to hit the whole bird than to hit a wing! There is a huge variety of bow types from all over the world. Below are descriptions of the bows most commonly used in the UK. This is the bow often associated with Robin Hood and Medieval times, though the current form is a Victorian design. 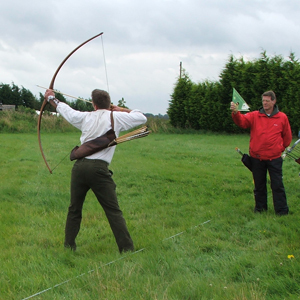 To comply with British Longbow Society rules, the bow must be of a 'D' section and made wholly of wood, with horn nocks at each end where the string is attached. The shafts of the arrows must be made of wood and the arrows must have natural feather fletchings. Arrow rests and sights are not permitted. The famous war-bows of the Middle Ages had draw-weights of between 100 pounds and 200 pounds. Modern target bows have much lower draw-weights, usually not exceeding 50 pounds. The softwood yew is the best known material for longbows, but suitable yew is hard to obtain today (and is a love-it-or-loathe-it material). Most modern longbows are made of hardwoods, usually using several laminations of different hardwoods. This bow was developed in the 1930s when scientists and engineers like Dr Clarence Hickman made detailed studies of archery equipment. They applied their findings and produced the American Longbow, usually known in Britain as the American Flat Bow (AFB). This is shorter than the English longbow and has rectangular-section limbs rather than the ELB's D-section. The AFB is popular in field archery and is the immediate ancestor of the Olympic-style recurve bow. In target and clout archery it competes in the barebow category. 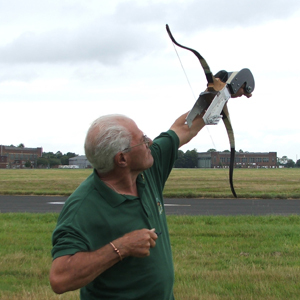 The photo shows Simon Stanley shooting an AFB for a world flight distance record for a wooden bow. This is the most common bow style in Britain today. The recurve bow evolved from the American flat bow, making use of woods, metals and synthetic materials. Bows with metal mid-sections (risers) and removable limbs have become the norm. Sight, arrow-rest, stabilisers, synthetic string materials and a clicker (as a draw-length check) are permitted on this type of bow. Arrows can be made of wood, aluminium, carbon/aluminium composites or carbon fibre. Most archers these days shoot carbon/aluminium or carbon fibre arrows since these reach longer distances more accurately than wood or aluminium arrows when shot from a bow of the same strength. Recurve archery is considered the easiest form of archery in which to make early progress, but the most difficult form in which to reach the top. 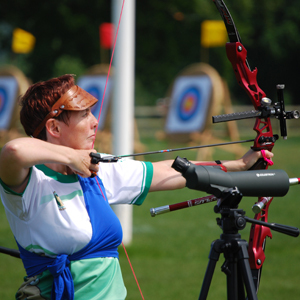 The recurve bow is the only type of bow currently permitted in the Olympics, though compound bows can be used in certain classes of the Paralympics. 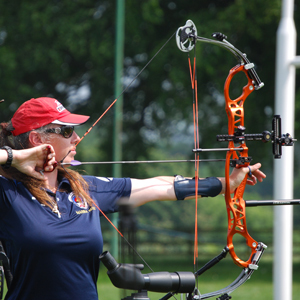 Most barebow shooters use an Olympic-style recurve bow without sights or stabilisers. Many others use traditional bow styles such as horse bows, Hun bows, American flat bows, Korean bows, etc. Depending on circumstances and preferences, the barebow archer may use an instinctive style of shooting (where aiming is similar to throwing a ball accurately - "rack o' t'eye" in Yorkshirese) or a more deliberate style in which various distance-estimating and aiming techniques are used to improve accuracy. Globally the most common bow style (thanks to over a million bow-hunters in the USA) and the second-most popular bow style in the UK. The compound bow evolved from the recurve bow in the 1960s. It is the most technically-advanced type of bow. To the uninitiated, the compound bow appears to have several strings, when in fact it only has one string plus one or more buss cables which connect the end of one limb to a cam at the end of the other limb. The limbs of a compound bow are very stiff. Stiff limbs are more energy-efficient than weak limbs, but there's a limit to how well an archer can draw very stiff limbs with the string directly attached. The cams and cables constitute a levering system which allows the archer to draw very stiff limbs. There are a few compound bows that use levering systems without cams, but the principle is ultimately the same. The compound bow tends to be shorter than the recurve bow. It consists of a metal riser and laminated synthetic limbs, at the ends of which are eccentric cams. The cams vary greatly in design and give each bow its individual shooting characteristics. A key characteristic of the compound bow is that as you draw the bow, the peak draw-weight is reached much sooner than with a recurve bow (at about two-thirds of the way through the draw-length), then as you continue to full draw the holding weight suddenly decreases by between 60% and 75% of the peak draw-weight. A compound bow is thus easier to hold at full draw. Compound bows usually have draw-stops which halt the draw at a certain length, tailored to the archer. Compound shooters are allowed to use a certain amount of magnification in the bow sight, can use a rear sight (known as a peep sight) and can use a mechanical release aid rather than fingers. Despite the complex appearance of the compound bow and its associated equipment, compound archery is a more pure form of shooting than other bow styles - once the equipment is set up, there is little to think about other than the execution of a good shot. Crossbows are bows that have a rifle-like stock, a lock mechanism for holding the string at full draw and a trigger for releasing the string. Crossbows are very rare in target archery, though their use is growing on the continent and has grown in parts of Britain, notably the West Midlands. Crossbows are more common in field archery, though still far less common than other bow types. Most archery clubs in Britain do not allow crossbows, as they have acquired a bad reputation because of the dangerous and anti-social actions of some owners. Most crossbow shooting takes place at clubs affiliated to the National Small Bore Rifle Association, the recognised National Governing Body for crossbow shooting. In flight archery there are several classes of bow, but most people shoot regular target bows in different bow-style and draw-weight categories. There are specialised bows for flight archery. Recurve flight bows are very short and shoot very short arrows (approx 14 inches or so) with tiny fletchings. These bows are so highly specialised that you cannot go into a shop and buy one - you have to find someone who will make one for you or you have to make one yourself. Compound flight bows (like the one being used by Barry Groves in the photo to the left) are similar, but even rarer - contact Ben Jones at Merlin Bows if you want one. All of the above bows except specialised flight bows can be used for field, target and clout archery. Popinjay is usually restricted to longbows, though traditional wooden crossbows are sometimes used.